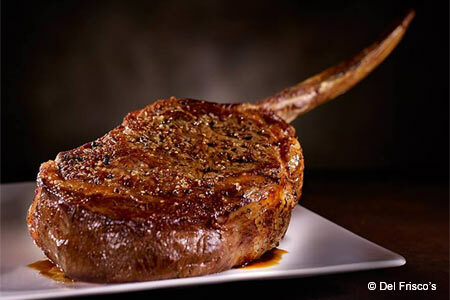 Liberty Wharf steakhouse offers Prime cuts of beef with a sizzling view. : Del Frisco’s isn’t your typical dark and clubby steakhouse, but a bright and open 13,000-square-foot space offering harbor and city views. Sit in a comfortable booth, at an indoor table, or outside on the sprawling patio, which offers diners a free seat for live music concerts at the nearby Bank of America Pavilion. Order the signature Champagne cocktail to complement the Shanghai-style fried calamari or smoked chicken and andouille gumbo to start. Move on to a juicy 24-ounce porterhouse or, for a heartier appetite, a Kansas City bone-in strip. Sides like the one-pound baked potato and mushrooms are predictable---and enormous. A better choice is the potatoes au gratin. Pair it all with a Cabernet chosen from one of the more than 10,000 wine bottles contained in the numerous wine walls that line the two-story restaurant. End the night right with a slice of six-layer lemon cake.